The Head Breeze ladies’ tennis shoes ensure you’ll play in comfort thanks to their breathable upper and cushioning midsole. The synthetic leather upper and the mesh tongue allow feet to breathe, and for extra comfort the shoes’ lining and collar are soft. The all-court profile, non-marking rubber outsole makes the trainers suitable for all types of court. The 550g (19.4oz) shoes have a shock-absorbing EVA midsole and an Inner Nylon anti-torsion bar incorporated into the outsole. These shoes look much more nicer aesthetically than in pictures. I'm not a fan of hot pink and was glad to see the shade of coral. Wore these and walked in them en route to break in the new shoes but was amazed by how comfy they were. No blisters, great ankle support and breathable even on a 33c hot summer day travelling on central line in London Underground. My feet are slightly flat but had no foot aches what so ever from these shoes. Recommended!!! 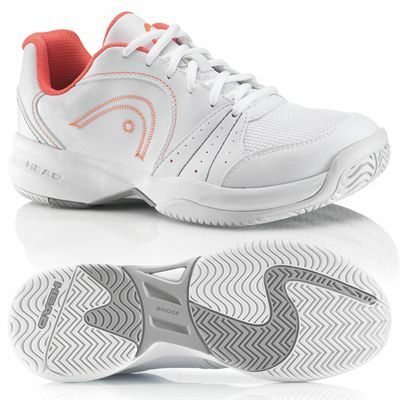 for submitting product review about Head Breeze Ladies Tennis Shoes.